Dr. Jacquie Smiles offers Invisalign for her patients near Midtown Manhattan 10016 to help straighten teeth and improve smiles. Invisalign is the most modern and safest way to straighten your teeth, offering a practically invisible solution to a perfect smile. For years, metal braces with tight brackets and bands were the only treatment plan or technique used for all orthodontics patients, but thankfully there is now a simple, more convenient solution for many to eliminate the self-conscious feelings that came along with correcting your smile. Dr. Jacquie Smiles is an Invisalign Elite Premier Provider in New York City and has been recognized as a top Invisalign provider every year since 2003. In September 2005, Dr. Jacquie Smiles became Align Technology’s National Spokesperson for a hygiene campaign. In 2009, she became a Spokesperson for Invisalign Teen treatment which was featured on the Tyra Bank’s show in June. Call us at 212-972-3522 or fill out the contact form to receive more information. What Dental Issues Can Invisalign Be Used To Treat? It’s a common misconception that since Invisalign is non-invasive and practically invisible, it can only treat mild orthodontics cases. On the contrary, Invisalign can treat most oral health alignment issues, from crooked teeth to overbites. Since Invisalign trays are made to fit your teeth specifically, they can be especially ideal if you only have a few misaligned teeth. Read our Invisalign FAQ to see answers to some of our frequently asked questions. During the development of your teeth gaps can form for several reasons. Prominent gaps leave portions of your gums unprotected, placing you at a greater risk for periodontal pockets and gum disease. When your upper and lower jaw does not align, you have what is called a crossbite. This causes your upper teeth to clamp down on your lower inside teeth in at least one location. If left untreated, over time a crossbite can cause excessive tooth wear, bone loss and lead to gum disease. If your jaw is not large enough to accommodate all of your teeth, crowding will begin to occur. This causes your teeth to grow in crooked as they push up against one another, fighting for the limited space in your mouth. The longer teeth are allowed to crowd your mouth, the more crooked they will become. When teeth are pushed together like this bacteria has more places to hide, increasing your risk for plaque buildup and other dental issues. Your lower jaw extending out past your upper jaw, causing your front teeth to sit in front of your upper teeth, characterizes an underbite. This can place excessive pressure on your jaw, creating discomfort, excessive tooth wear, and even TMJ disorder. When you close your mouth, if your upper teeth extend past your lower teeth you have an overbite. This can be solely a cosmetic issue but in some cases, it can lead to gum issues, jaw problems and unnecessary wear on your lower teeth. When your mouth is closed and your top teeth don’t reach to meet with your bottom teeth you have an open bite. Too much thumb sucking as a child or a genetic abnormality in your jaw structure can cause open bite. If not addressed this can lead to discomfort, TMJ disorder, speech problems, and difficulty chewing. One the greatest things about Invisalign is that the trays are easy to take in and out of your mouth, meaning you can remove them before eating a meal. This allows you to enjoy all your favorite foods as you usually would, without having to worry about getting food caught in a bracket or breaking a wire. Just be sure to clean your teeth and Invisalign before inserting your trays back over your teeth. Cleaning your teeth with traditional braces can take an excessive amount of time if properly maintaining standard oral health. When done improperly you risk yellow or white spots forming on your teeth beneath your braces. Since Invisalign is removed while you brush and floss your teeth, you can clean as you normally would without the risk of missing certain spots. Traditional braces have metal hardware that can stab into your gums and cause injury in sports and other physical activities. Since Invisalign sits flush with your teeth and includes no hardware, it is 100% safe to run, play, and even fall! It can take a couple years to completely straighten your teeth. During this time you are sure to attend an important event that includes lots of photography and documenting special memories. If you are wearing your Invisalign, no one will ever notice, allowing you to smile wide for the camera no matter the occasion. Traditional braces can rub up against your cheeks, causing discomfort and canker sores. Since Invisalign clings tight to your teeth without any protruding hardware you will experience less discomfort. The German Department of Orthodontics recently conducted a study to see how happy patients were while wearing Invisalign. Turns out, 93% of study participants considered Invisalign so comfortable they didn’t experience any impairments at all. Even though Invisalign is more comfortable, it still gets the job done; 89% of the same study participants were pleased with the speed of their progress. Since Invisalign trays are switched out in the privacy of your home, you don’t have to visit your orthodontist for frequent adjustments, as with metal braces. Typically patients only need to visit their orthodontist about once every 6 weeks while wearing Invisalign. Schedule your no-obligation Invisalign consultation near Midtown Manhattan with Dr. Jacquie Smiles at her office located at 30 East 40th St. New York, NY 10016. Checkout our Invisalign special offers and coupons for new Midtown patients located in near 10016. 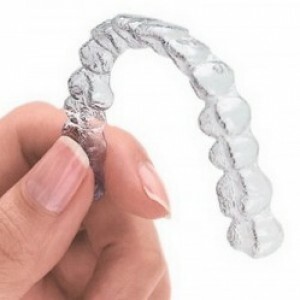 Invisalign aligners are practically clear. No one may even notice that you’re wearing these virtually invisible “braces,” making Invisalign a seamless fit with your lifestyle and day-to-day interactions with others. You will not be self-conscience that your peers will be distracted. Invisalign is removable. Unlike braces, you have the flexibility to eat and drink what you want during treatment by simply removing the aligners. You can also remove the aligners to brush and floss as you normally would for fresh breath and overall good oral hygiene. Unlike braces, there are no metal brackets or wires with the Invisalign system that could cause irritation to your mouth. Plus, since your office visits during treatment don’t involve metal or wire adjustments, you’ll likely spend less time in the doctor’s chair. Finally, Invisalign allows you to view your virtual results and treatment plan before you start so you can see how your straight teeth will look when your treatment is complete. 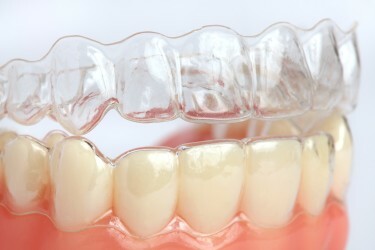 The invisible aligners, which are made of a thermoplastic material uniquely developed for the Invisalign treatment plan, look similar to tooth-whitening trays. Invisalign aligners are custom-made for you and only you to move your teeth in the sequence determined by your doctor. 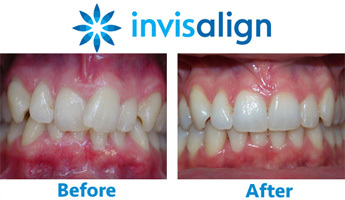 More than 500,000 patients worldwide have been treated with Invisalign. The number of Invisalign smiles and happy smiles grows daily. Dr. Jacquie Smiles has successfully treated many patients located near 10016 with Invisalign to help them straighten their teeth and improve smiles. The length of treatment is determined by the doctor and depends on the severity of each individual case. However average cases take about 12 months. There is a feeling of pressure and discomfort when first starting your Invisalign treatment. Patients may also experience pressure and discomfort at the beginning of each new stage throughout the treatment process. This discomfort and pressure is due to your teeth moving into place and is considered a good sign that your treatment is working. The pressure and discomfort lessen after a few days. Are there food restrictions during the treatment process? There are no food restrictions. You are required to remove your Invisalign aligners before eating every snack or meal. This allows our NYC patients the freedom to eat whatever they wish. Aligners should be worn 20 to 22 hours per day. Preferably only removed when eating or brushing teeth. Will the Invisalign aligners affect speech? There is an initial adjustment period and it takes time to become familiar with having an object in your mouth. However, a vast majority of patients report no negative effects on speech. How often is a visit to the orthodontist required during treatment? Your orthodontist will request to see you every four to six weeks. This is necessary to keep track of the progress that is being made throughout the treatment process. Will dental insurance cover the cost of Invisalign treatment? Since dental plans vary, our New York City patients are encouraged to contact their dental insurance company to see if orthodontic treatment is covered under the plan. Are payment options available for Invisalign treatment? Most orthodontist offices offer their patients a flexible payment plan. These types of plans usually require a percentage of the cost and affordable monthly payments. Is a retainer required after treatment is complete? Yes. Your orthodontist will recommend that you wear a retainer to prevent teeth from shifting back to their original position. The frequency and duration depend on each individual case. How do patients get started with Invisalign? Those interested in beginning their Invisalign treatment should visit their NYC orthodontist for a consultation. The orthodontist will guide the patient through the process of Invisalign treatment and if it is best suited to their specific needs. Have more questions about Invisalign? Call our NYC office at 212-972-3522 conveniently located near 30 East 40th St, New York, NY 10016 to speak to one of our friendly staff. Invisalign is truly one of a kind, allowing you to live your life freely while still obtaining the straight teeth you’ve been dreaming about. Invisalign isn’t right for everyone, but it can effectively treat many orthodontics patients. 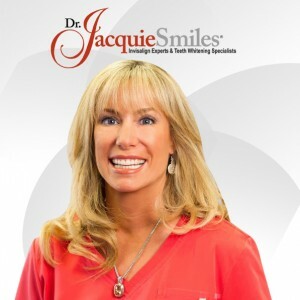 Dr. Jacquie Smiles has been selected from over 55,000 practicing dentists and orthodontists as an Elite Provider of Invisalign. She is also considered among the top 1% of doctors in North America. To schedule your complimentary, no obligation Invisalign consultation near in Midtown Manhattan 10016 to find out if Invisalign is right for you, please call us at 212-972-3522 or fill out the contact form to receive more information.